(August 12th, 2015) After a month of filming in Western New York at a plethora of locations in downtown Buffalo, Hamburg, Angola, West Seneca and Clarence, Deftone Pictures wrapped it’s latest feature “S.T.A.R.” [Space Traveling Alien Reject] on August 9th. 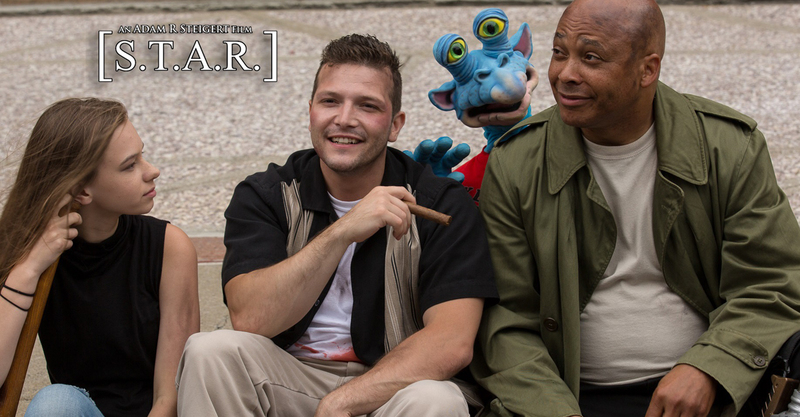 “S.T.A.R.” tells the story of a once famous award winning horror and science fiction writer Greg Vincent who is now a struggling, alcoholic. Looking for inspiration for his next story so that he can pay off his debts with a notorious Italian crime lord, Vincent finds himself struggling. In attempt to find his next story he finds himself doing meet and greats at a local library on the outskirts of Metsburgh. It’s here he meets S.T.A.R, a reject escaping death on his home world of Mars in search of a safe haven from the hideous “Meroarks”. With a deadline given by the mob, and alien beings on the trail of S.T.A.R., the race is on to save them both. 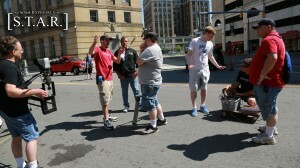 Director/Writer Adam Steigert (second from left) sets the scene in downtown Buffalo. With a Spring 2016 release S.T.A.R. [Space Traveling Alien Reject] promises to broaden the age limitations normally seen from horror and science fiction films. Adam R Steigert directed and wrote “S.T.A.R.” which reunited him with “Not Human” star Richard Satterwhite as Alex Creed and “A Grim Becoming” co-star Aryn Fitzgerald as Marissa. The film will also stars newcomer Christopher Barbis in the title role of Greg Loomis, Lori Cholewka as Lana, scream queen Nicola Fiore as Sarah, supermodel Melyssa Jade as Angela Branco, and Patrick Mallette is voicing and puppeteer-ring the S.T.A.R. character. Check out DefTone Pictures Studios website for more information.